Mmmmmmm Ray’s Hellburger. You might have heard of it, it was on the Daily Show after Obama and Biden visited (note: clip mentions Smith!!). I can tell you this: since then, it’s been busy. Don’t-try-going-on-a-weekend busy. It was busy before. It’s painful now. But it’s really good. 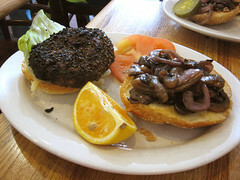 The burger can be “au poivre” (coated in cracked pepper, as pictured), “cajun” (spicy), or just normal. You can get it “cooked through”, “medium”, or “recommended” (very pink). People criticized Obama for wanting his burger on the more cooked side, and while I do enjoy a good “recommended”, it is VERY juicy and VERY messy, and the “cooked through” is much easier to eat. Even when you do get “cooked through” you’ll need the roll of paper towels on every table. Some toppings cost extra- there’s a wide selection of cheese options. I hear they’re good, and worth the couple dollars extra. And then there’s the bone marrow and foie gras options– again, I haven’t tried them. What I have tried are the mushrooms, the onions, the pickles, the “heck sauce” (think thousand islandish, just like everyone else’s special sauce.) It’s all very good, and these don’t cost extra. There aren’t fries. There are chips, sometimes corn on the cob, sometimes Mac&Cheese. The burger comes with either an orange “smile” or a piece of watermelon depending on the season. But seriously, the burger is very… beefy. When I eat here, I have enough trouble finishing the burger. I don’t have room for other things. It’s very good, and it’s a great experience. But it’s become a little touristy, it’s become very crowded and rushed, and I just can’t recommend it on a weekend during the lunch rush (which, on the weekend, extends to at least 3 or 4). It’s cash only, but there’s an ATM in the back. If you’re willing to brave the loud and the crowded, and fight a little for a table, it’s a very good (if messy) burger that awaits you.